ALL BALL NERVE CENTER — It’s unclear exactly what has happened in this clip. I’ve watched it in slow motion about five times and am still unsure how this happened. Either way, Orlando’s Aaron Gordon is out on the perimeter when all of a sudden his right shoe shoots off his foot and flies from the three-point line, into the paint and ends up down under the basket. While the shoe is doing its thing, Gordon drives into the paint wearing one shoe and takes a shot. And as Gordon is driving, Miami’s Chris Andersen delivers a swift kick to Gordon’s bouncing shoe and boots it out of the lane. Crazy play. ALL BALL NERVE CENTER — I do not have any tattoos. Years ago, this may have put me in a societal majority, but these days I’m not so sure. Today tattoos are common, and particularly in professional sports. In the NBA, where guys run around with most of their bodies exposed, the art is particularly visible. And in some cases, even when it isn’t visible, guys are still inked out. If you’re interested, Slate put together a pretty amazing interactive compendium of NBA tattoo art that you can get lost in. Worth noting: After free agency, there’s going to be a lot of re-formulating to be done. ALL BALL NERVE CENTER — On days during the NBA Finals when there are no games being played, the NBA organizes what is called Media Availability. Basically, each team takes a turn facing the assembled media, answering a similar gauntlet of questions about the game that just happened or the game that is about to occur. 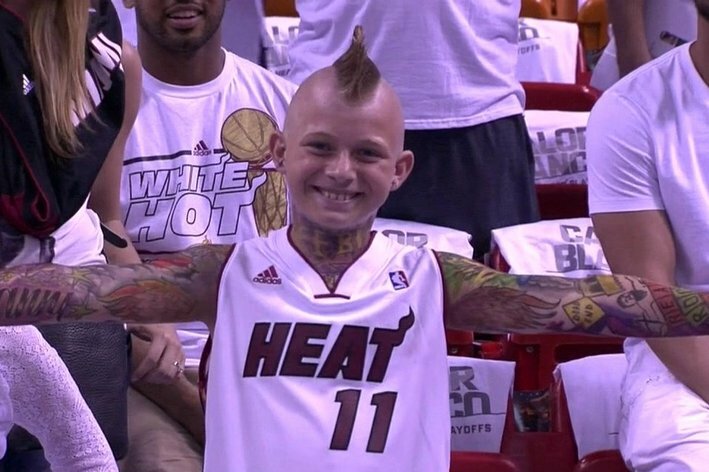 One day last weekend in Miami, I decided to ask Chris Andersen, the Birdman, about his take on NBA style. We’ve seen how he’s evolved, but we haven’t really heard him speak on it. So I sidled up to him during media availability, asked him a few questions, had a laugh, and moved on. It was a short exchange, basically a minute long, so I wasn’t really sure what to do with the video. Post it? Or just forget about it? ALL BALL NERVE CENTER — The Miami Heat have received an unexpected boost this season from Chris Andersen, aka The Birdman, aka Birdman Birdman. For a team that won a title last year while constantly shuffling their center rotation, Andersen has given them a stable option off the bench, always energetic and frenetic and moving and contesting. He may not be the most skilled player in the paint, but he always plays hard and comes to play, which is more than you can say for a lot of NBA bigs. Of course, a large part of the Birdman package is his look — Birdman is The Illustrated Man, covered with colorful tattoos, right up his arms and up to his chin, like a turtleneck of ink. This is topped off by an aggressive mohawk that somehow stays vertical throughout an entire NBA game. Check it out up close. Fly, Freebird.